This article is based on IPA Industry Benchmarking Consortium (IBC) research titled: “Site Staffing Strategies: What Drives Success?” (March 2017) by Alex Ogilvie, Deputy Director, IPA Project Research Division, and Jay Russo, Associate Research Analyst, IPA Organizations and Teams Services. There is a natural friction between industrial plant managers and site-based capital project directors. Plant managers are under pressure to drive down capital project costs, and one of their go-to tactics is reducing project system overhead. Core project functions—including project managers, engineers, project services, and construction management—are usually not spared from reductions in force to the site-based project organization. Meanwhile, project directors are still expected to achieve greater return on investment on the projects they are executing, as less money is being authorized for the construction of large projects to bring in revenue. Plant managers and project directors alike cannot ignore the importance of balancing site-based project portfolio expectations and needs. But determining whether a staffing approach can drive site-based project outcomes is no walk in the park. An IPA research study that evaluated nearly 80 project sites found large variability in full-time equivalent (FTE) project system staffing. So IPA researchers took a closer look at site project system staffing approaches to see whether staffing characteristics affect capital project outcomes. The sites examined are representative of the chemicals, refining, pharmaceuticals, and mining industries, with a median annual portfolio spend of $98 million in delivering an average of 112 projects annually and with representation from much smaller and larger sites. Each of the four site-based project system staffing approaches was then assessed based on project outcome measurements, including cost, schedule, and internal rate of return (IRR), as well as use of Best Practices for project development, including Front-End Loading practices. Although the research found that all four staffing approaches can deliver successful project outcomes, the most successful projects are delivered at sites that employ the owner engineering approach. Even owner engineering sites with the lowest IRR performance delivered projects that achieved nearly 15 percent IRR. In contrast, a full alliance staffing strategy in which owners provide limited contractor oversight delivered projects with under 9 percent IRR. Although it may seem that an owner heavy approach would be expensive, we actually observe the opposite. 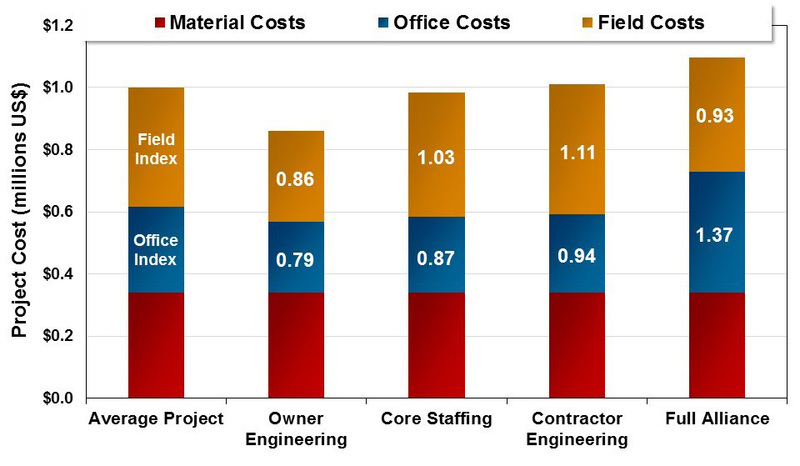 When costs are considered holistically, projects executed at sites that employ high contractor secondment strategies tend to be more expensive. It is important to note, however, that this is not an argument against using contractors, who are an important element of most site-based project organizations. In fact, it is possible to be successful in any of the four strategies. Rather, it is a call to understand which strategy is most appropriate given site circumstances and to find the right balance of owners and contractors given the strategy being employed. Sites with large and stable project portfolios ordinarily capture the benefits of fixed staffing, characteristic of both owner engineering and full alliance staffing approaches. On the other hand, sites with fewer engineering resources available in their local market are apt to have a more flexible staffing approach in place, namely core staffing and the contractor engineering approach. What site management often underestimates is the importance of owner staffing of core project functional competencies, especially project functions previous IPA research has determined are crucial to delivering industry competitive capital projects. Case in point, IPA found that the positive performance of the owner engineering strategy is driven by strong owner staff representation across the entire project system. Although capable of delivering successful projects, sites using more “adaptable” and contractor heavy staffing approaches, by definition, rely more contractor personnel to deliver projects and they tend to have few owners to manage the contractors. On average, IPA found that wages for contractor FTE project managers and engineers was slightly lower that for owner equivalents. However, the contractor FTE headcount is regularly higher than the number of owner FTEs that otherwise would have been employed to accomplish the same amount of work. In other words, the best performing site-based project portfolios are able to achieve the proper balance between portfolio expectations and resource management. 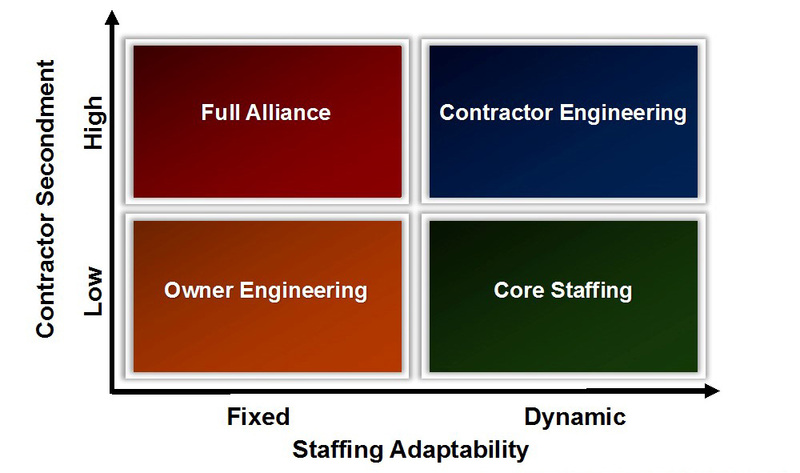 Key to accomplishing this balancing act is finding the right mix of owner and contractor staffing for the site. Often times, it is up to project leaders to convince business managers why a site cannot afford to understaff owner project competencies. With site projects now having an average design life of 20 years, greater care and consideration should be given to staffing the right people for the right projects. By measuring site project performance and hiring owner personnel with the leadership attributes best suited for core competency functions, site-based capital investments can deliver greater value for business. For more information about IPA’s site-based project evaluation and organizations and teams assessment offerings, please visit IPA’s Organizations & Teams page.